Welcome to a wonderful opportunity to patronize the arts--in the real sense of the word--by becoming a parent to the artistic process. This is how it worked in the old days when those with the means provided seed money for artistic endeavors. Now even we commoners can be patrons of the arts by providing seed money via the Kickstart program. 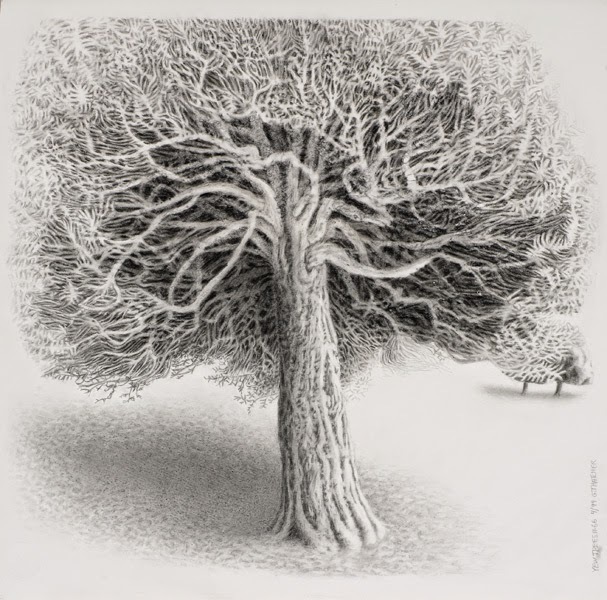 One artist in particular, Greg Thatcher, is using the Kickstart program to fund his continuing artistic and spiritual relationship with the ancient yew trees of England. The great thing about this program is that anyone can help fund this project, the "Plein Air" of the Sacred Yews, if you've got at least a buck to kick in. Greg Thatcher's Kickstarter project goal is to spend one month of "intensive drawing in Painswick, Gloucester, UK. The goal is to finish a detailed drawing, and research galleries in the UK." I have been working on a series of "plein air" yew tree drawings since 1991 based on the topiary yew trees in St. Mary's Churchyard, Painswick, Gloucestershire, England. Last summer, I began a new "plein air" drawing and clocked in 130 hours on location in Painswick. The drawing is about half-way finished. With your help this summer, I want to return to England and complete the drawing. 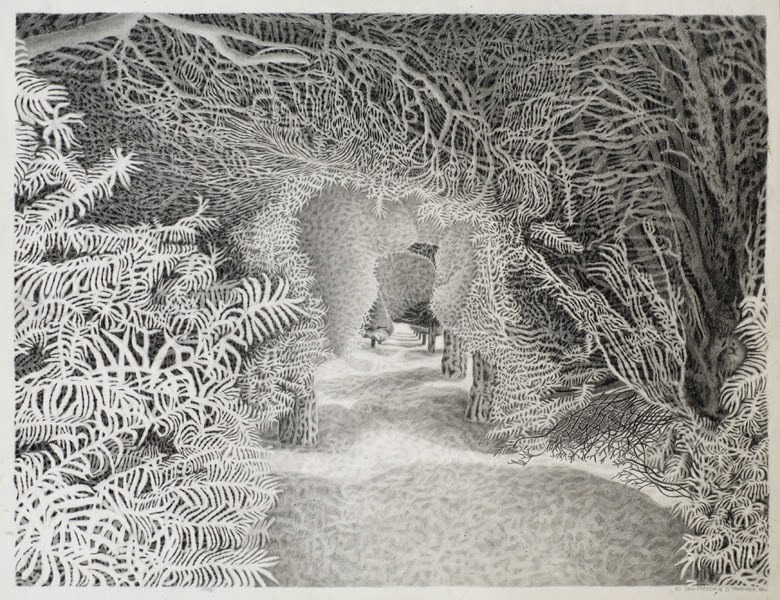 I also plan to continue searching for suitable gallery representation as well as press coverage to help raise awareness about my work and the significance of yew trees. The Kickstarter site describes his "unique, generous rewards program" that includes prints of his work. The site also includes a video showing the beauty of the Painswick, UK, area and the incredible yew trees. My wife and I are excited about receiving some prints and are already looking at the walls and wondering where in the house to mount Greg's art. Making a donation was as easy as buying something from Amazon--in fact, it was an Amazon "purchase"--very easy and simple. The direct experience of an artwork is primarily an internal experience, based solely upon our level of consciousness and our mental impressions and past experiences. Experiencing an artwork with openness can provide us with direct contact with our deeper selves and, at times, a beautiful epiphany that reaffirms the divine. This is my goal, and I hope that you will experience some of the joy, inspiration, beauty and raw primal forces of nature that I experienced while drawing. I've known Greg as a teacher and friend for almost ten years. What I admire about him is his dedication to his art and how as a teacher he is able to model for his students what it means to live the life of an artist, of how refining one's artistic vision is not only an evolution of one's art but can also be a process that leads to personal growth. Greg walks the talk. His art is beautiful, and since he's going to England, I feel free to quote Keats: "Beauty is truth, truth beauty,—that is all /Ye know on earth, and all ye need to know." Become a patron of the arts. Provide seed money for the advancement of art--and, therefore, truth. It's money well spent. 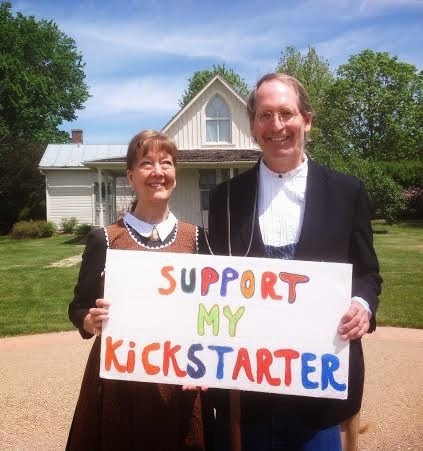 Funding Greg Thatcher's "Plein Air" of the Sacred Yews project will add beauty to the world. I feel better because of my donation. As of this blog post, only six days are left for the funding. Now it's your turn. Tom, what an incredible gift! As a leader of an unsuccessful Pubslush campaign, I am acutely aware of the likelihood of failure with crowdfunding projects. In fact, every crowdfunding project that succeeds has several, if not dozens, of committed rebloggers doing exactly what you did here for these Brits who admirably stepped into the American Gothic meme for a giggle at the end of a post. Incidentally, are you from the world capital of TM, Fairfield, IA? I'm jealous. Also, I'm www.ronaldfischman.com, and have stopped maintaining my Aquaversepoetry.blogspot.com account. Project success! Thanks for your words of experience and support.